Samsung Engineering jointly with United Nations Environment Programme would like to launch "The 9th Eco-generation Environmental Essay Competition" inviting young people all over the world to raise awareness on the theme of the upcoming World Environment Day – The fight against illegal trade in wildlife. 100,000 African elephants were killed between 2010 and 2012, out of a population estimated at less than 500,000, just to supply a demand for products made of ivory items like jewelry and carvings that are used for gifts. Pangolins, unknown to most of us, are the most illegally trafficked animal on earth with millions being used for medicinal value and food delicacy. Rhino poaching increased by 8 900% since 2007 their horns used for medicines and hang over cures. Most of these products, which have good or much better alternatives, are related in some ways for showing status. If we don't take action, these beautiful animals could disappear forever. But we can change this! This year, World Environment Day (WED) and World Wildlife Day (WWE, March 3) decided to focus on Illegal Wildlife Trade (IWT). WWE was celebrated under the theme 'The future of wildlife is in our hands'. World Environment Day (WED), on 5th June, which is the single biggest day to raise awareness on environmental issues, is hosted by Angola. Eco-generation is inviting you to think about our roles to fight against illegal trade in wildlife together with the Tunza Eco-generation members around the world. We would like to provide children and young people a chance to discover and investigate the wildlife around them, in their community and to identify what they can do to help stop illegal trade in wildlife even though many live in urban areas. We also aim at collecting inspiring and creative ideas from the young people on how and what to do! *한글로 접수를 원하는 지원자는 '이 곳'을 클릭하여 한국어 부문에 지원하여 주시기 바랍니다. • Samsung Engineering reserves First Serial Rights on all submissions. All other rights to the essay remain the property of the author. • All entries must be original works, in English. Plagiarism and off topic will result in disqualification. • Entries may not have been previously published in professional media. • Entries should be attached by the file in one of the following formats. All other formats will be disqualified. • Entries must be from 600 to 1000 words in length. 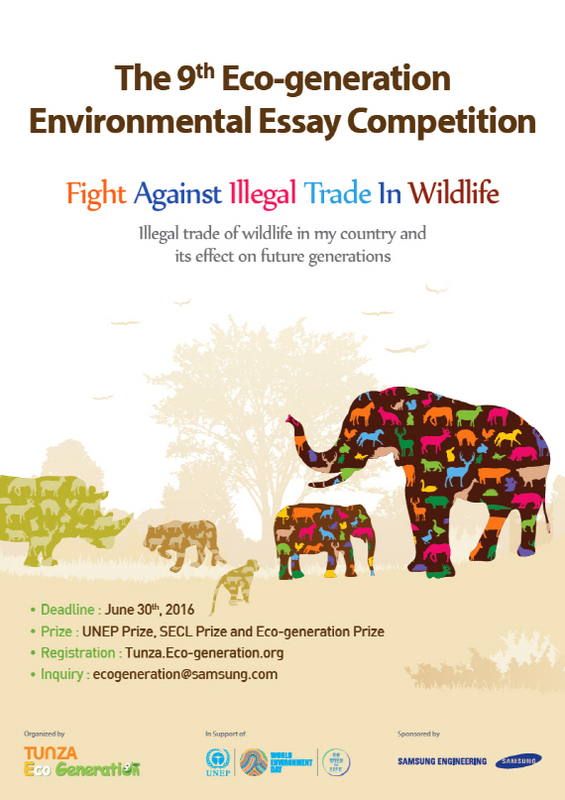 • Entrants must first register at Tunza.eco-generation.org in order to submit their essay online. • All entries must be double spaced in 11pt, with numbered pages. reachable due to wrong information (contact number, address and etc.) prize will be canceled and automatically be given to the next place applicant. • Each entrant may submit only one essay. • All entries are final. No revisions are accepted. • The decisions of the judges are final and are entirely their own and in no part represents the opinion of Samsung Engineering. • At the discretion of the judges, all well written essays may be published on the Website. Samsung Engineering established Eco-generation in 1996 as one of the largest environmental education programs for children and youth in Korea. In 2006, Samsung Engineering expanded the program to the Asia-Pacific region by launching an English Eco-generation (www.eco-generation.org) website in partnership with the United Nations Environment Program (UNEP). www.eco-generation.org is a children's educational environmental website that emphasizes learning and sharing knowledge about the environment. On September 27, 2011 Samsung Engineering and UNEP made steps to reach an international audience by launching tunza.eco-generation.org, a new environmental networking platform for children and youth. Tunza.eco-generation.org is an interactive environmental website that will serve as a platform to educate the community about the environment and create eco-friendly initiatives. With a 20 year history, Eco-generation is Samsung Engineering's largest running CSR program, which has been supported by Samsung Engineering's expertise in the environmental business. This will continue to be one of the company's core initiatives to support and contribute the new generation via environmental education. Tunza Eco-generation is the social networking platform to be an interactive and vibrant site presenting various possibilities to engage youth, children and organizations from various portals (chat – global, regional and thematic platforms webpage's with dynamic functions where children and youth are able to upload/update their environmental activities which will then go live online after it has been cleared by an administrator of the platform, possibility of working on documents and editing of the same can take place online various tutorials between experts and young people voting functions/processes on various competitions, databases for various children, youth and sport processes). About Samsung Engineering Co., Ltd. The United Nations Environment Programme (UNEP) coordinates United Nations environmental activities, assisting developing countries in implementing environmentally sound policies and practices. It was founded as a result of the United Nations Conference on the Human Environment in June 1972 and has its headquarters in Nairobi, Kenya. UNEP also has six regional offices and various country offices. In order to ensure full participation of global communities, UNEP works in an inclusive fashion that brings on board different societal cohorts. UNEP is the designated authority of the United Nations system in environmental issues at the global and regional level. Its mandate is to coordinate the development of environmental policy consensus by keeping the global environment under review and bringing emerging issues to the attention of governments and the international community for action. 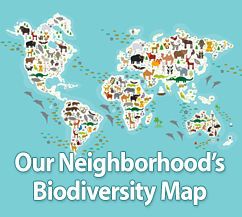 Its activities cover a wide range of issues regarding the air quality, marine pollution and terrestrial ecosystems. It has played a significant role in developing international environmental conventions, promoting environmental science and information and illustrating the way those can work in conjunction with policy, working on the development and implementation of policy with national governments and regional institution and working in conjunction with environmental Non-Governmental Organizations (NGOs). UNEP has also been active in funding and implementing environmentally related development projects. I can't wait for the result! all the very best for all the entrants of this essay competition globally. I had research up to a week hope its will worth-place..
how can I upload my assey? Is here any e-mail? Is the deadline local time?? I'm glad you chose this topic! I've learned a lot just by researching for my essay, and I'm thankful for being a part of this great community! I wish everyone good luck. This is a very good topic as it increases awareness on illegal wildlife trade in our region. Thank you Tunza Eco-generation for a great topic! A good topic theme, at a right moment as well as to the right generation...let our ideas hit the World no matter who is going to win,...let us strongly participate and i am on progress to do so. such type of essay competition would certainly motivate the youth like us to carve the bright path of our nation indeed. Great theme for essay! Thanks TEG. Looking forward to this contest. I have registered my account can I summit my essay? Good competition,i want to talk about our elephants...best of luck all. most challenging topic for today!!! i would like to know if we can add pictures. Thank you! It's time for the youth to champion wildlife protection. Wow! I will join this competition for sure! Another great opportunity and inspiration from Tunza on a great topic that is very important for sustaining our eco system. I think this would trigger the thought process in all our minds as to how wildlife should be protected. Thank you Tunza. Wahoo, This time I wont miss the chance. What an apt topic and what a way to promote it. Let's fight against illegal trade in wild life. Thanks TEG. Great event!! and beautiful theme. Great initiative. It deserves attention now more than ever. I wish all the eligible participants best of luck. This is one topic that needs attention and I thank TEG for bringing it up. Let's make it trend and draw some attention.